Lisbon is a beautiful city but, that has only recently begun to be part of the list of destinations to visit for most of the tourists. 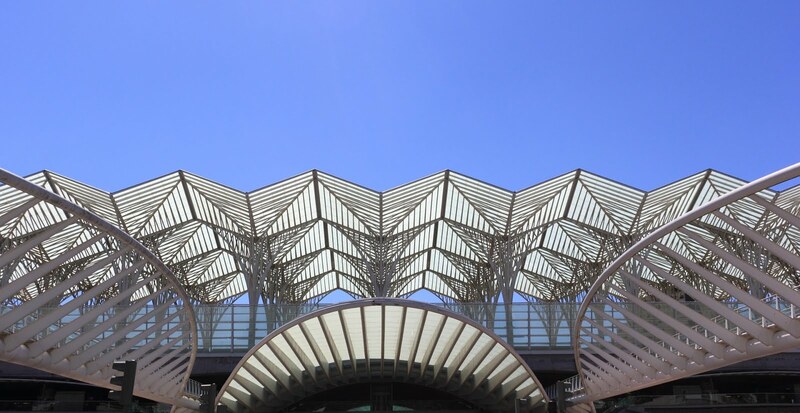 Situated in the western tip of Europe, it has always been a distant destination but, with the increase in the number of airlines flying directly to Lisbon, this scenario has been changing. Owner of a centuries-old history, of an enviable gastronomy, with about 300 days of sunshine a year and with prices of the lowest in Europe, besides its proximity to several beaches nearby, this is a perfect destination for a family trip, whether we are talking about a long weekend, or a week's holiday. The start of any tour of Lisbon may be linked to the location of your accommodation, but we can not forget to start your day with a visit to Praça do Comércio (also known as Terreiro do Paço). This is a point that can never be missed in any visit to the city of Lisbon. When you get here, it's like arriving at the Heart of the City. This was the traditional gateway into the city through maritime traffic, which reached the Atlantic Ocean through the Tagus River. This was one of the areas most destroyed by the 1755 earthquake that destroyed much of the city of Lisbon and decimated a large part of the population, first through the earthquake, after the tsunami that hit the population, which weight to the Perreiro do Paço to be safe from the ruinous buildings in the narrow streets of the city. This is one of the most emblematic and historical places of Lisbon, facing the Tagus River and the statue of King D. José I to mark the center. Do not miss exploring the Cais das Colunas, by the river. This is undoubtedly the perfect place to start and/or end a day in Lisbon. In the late afternoon, be sure to explore its esplanades for a refreshing drink or delicious ice cream. Lisbon Story Center is located right in the Commerce Square. This is a new, modern Museum that tells the history of Lisbon in a very interactive and fun way, with a special focus on the 1755 earthquake and the way the city's history has changed. Fundamental to understand the history of Lisbon and Portugal, in a very interesting and fun way. For more information, including prices and times, see the website here. The Augusta Street Arch is a monumental beauty that gives a special glow to one of the most beautiful squares in the world and since 2013 it is possible to climb to observe the 360º view around you, allowing you to see Lisbon and how it connects to the Tejo River. If you are interested in visiting, you can click here for access to more information, namely on the price and timetables. Then, get ready to visit Rua Augusta, which connects Praça do Comércio to Praça Dom Pedro IV (Praça do Rossio). This is a street closed to traffic, filled with brand stores from all over the world, as well as a lot of gastronomic offerings (do not forget to taste the traditional Portuguese sweets, see the shop windows and let yourself be guided by your senses). We also suggest a visit to the new Benfica Store, the largest club in Lisbon and Portugal, located on Rua Augusta (see here the exact location on google maps). This modern store will not fail to do the wonders of the whole family. 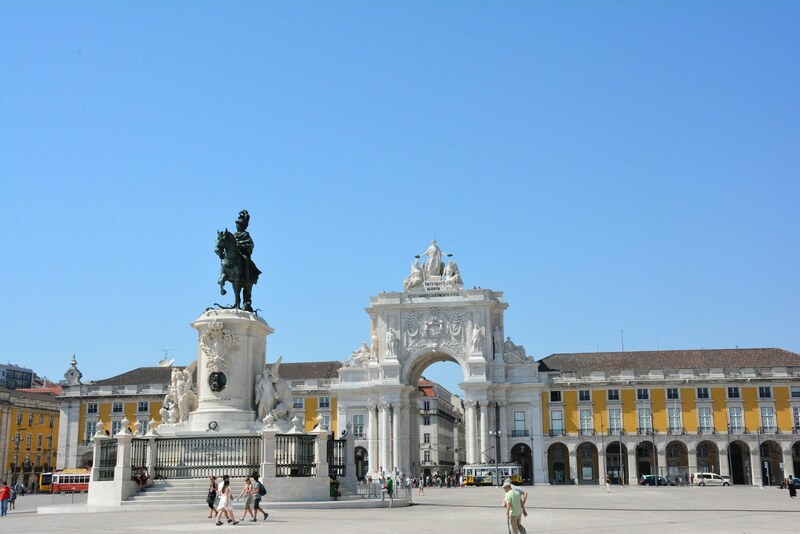 Also known as Rossio, this is one of the most beautiful squares in the city. This is a place full of history, as well as shopping and perfect terraces. Something that we can not fail to suggest (adults, not children), is to try the famous Ginginha, a typical Portuguese liquor. It is located at Largo São Domingos, nº8, right on the right side of the D. Maria II National Theater, at the northern tip of Praça Dom Pedro IV (see here the exact location on google maps). Right next to Ginginha, in Praça da Figueira, take the opportunity to visit the Church of São Domingos. This is one of the most famous churches in Lisbon but unfortunately not just for good reasons. This is one of the most beautiful churches in Lisbon, XIII, in which several marriages linked to the realization were performed, but it is also famous for more sinister reasons, namely for having been linked to the Inquisition and being the place of exit many condemned to death to run in the public square. In 1959 its rich interior was seriously destroyed by a fire and although it was rebuilt and reopened to the public in 1994, the marks of fire are still visible. Entrance is free and worth a quick visit. We invite you to follow the way to another historic square of the city, Restauradores Square. Do not miss the 30-meter Obelisk called the Restauradores Monument, which commemorates the liberation of Spanish rule over Portugal in December 1640. It is also from this Square that has access to Elevador da Glória. Opened in 1885 and since 2002 considered a National Monument, it is a must see that connects Praça dos Restauradores and Bairro Alto. If you want to know the best of nightlife, this is one of the best places to go, with several bars, restaurants, and nightclubs that will surprise you, as well as another of Lisbon's attractions, the nightlife. If for the kids the nightlife is not part of the main attractions, this elevator climb will be. You can go using your Viva Viagem Card. Check here to know more information about the price and timetables. 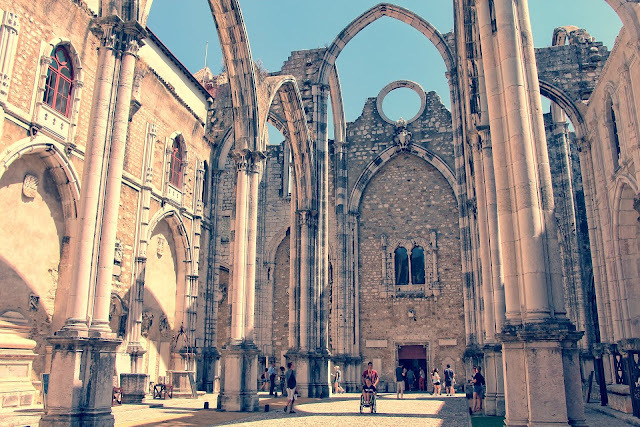 Then we will take a stroll along the streets next to Bairro Alto de Lisboa until arriving at the Ruins of the Convento do Carmo, a former convent of the. XIV, but which was partially destroyed in the earthquake of 1755. Today it is the Archaeological Museum of Carmo and is undoubtedly an interesting visit, with pieces ranging from prehistoric times to the present. If you don't want to enter, you can enjoy the exterior of the old Convent and enjoy visiting the Terraços do Carmo. This is a completely renovated space where you can also enjoy an amazing view of the city, drink a drink or just relax at the end of a day out. Must-see and free entry and the place to take a photo. To access more information about the Archaeological Museum of Carmo, namely on prices and schedules, check its website here. 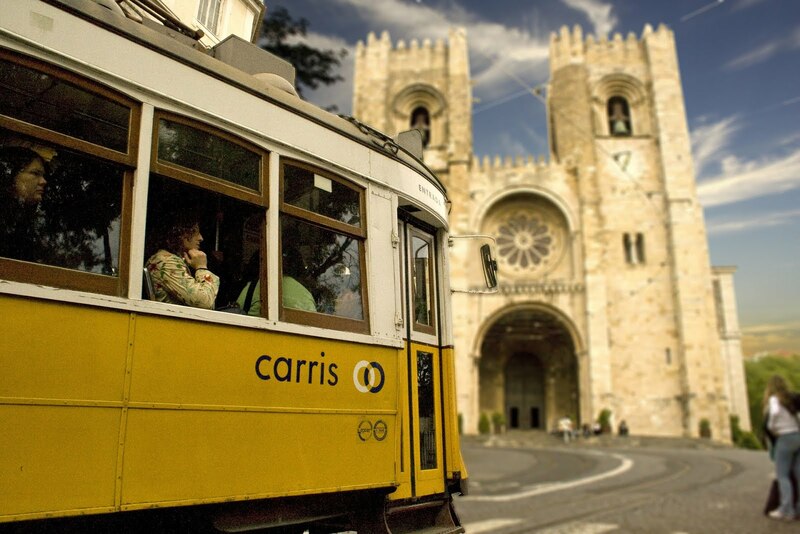 Right next to the ruins of Carmo is the Elevador de Santa Justa, also known as Elevador do Carmo. 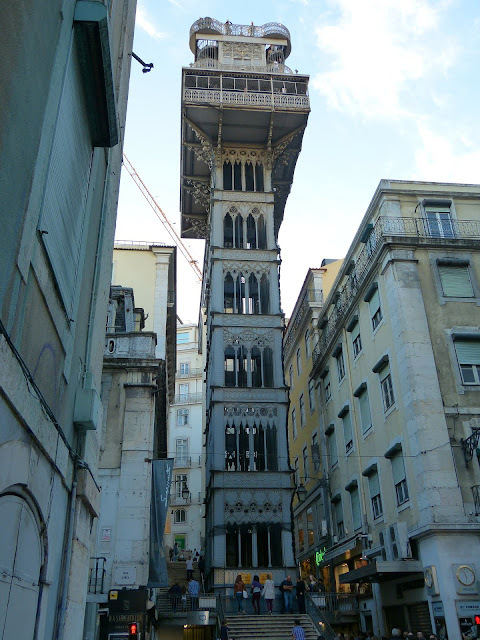 This elevator, inaugurated in 1902, is one of the most interesting monuments of Lisbon's downtown and allows a quick connection between the ruins of the Carmo Church and Rua do Ouro. This is an industrial-era elevator, magnificently crafted in cast iron that makes it feel even in 1900. The journey is fast but a must-see. 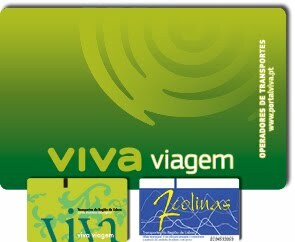 You can also use your Viva Viagem card on this transport. To access more information, including prices and times, see its website here. Then stroll through Chiado, one of the noblest neighborhoods in the city, located between Bairro Alto and Baixa Pombalina. This is one of the liveliest areas of the city, full of commerce, restoration, and life. 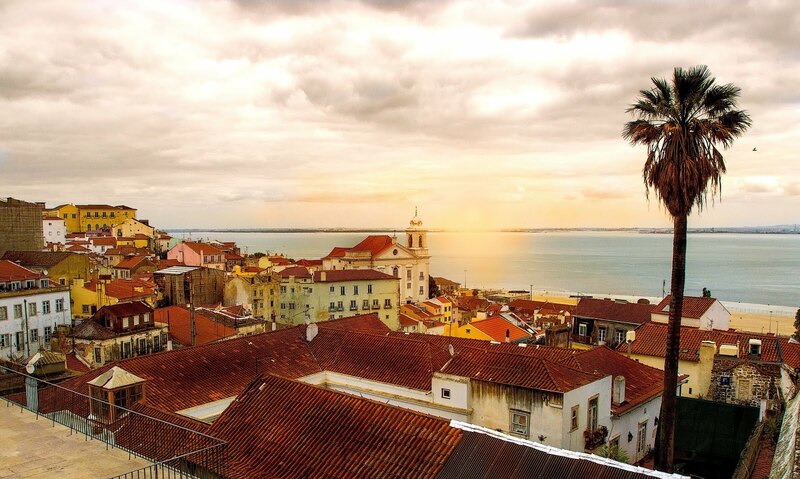 Let yourself be lost in its streets and feel the energy of Lisbon. They also have a mall, with restaurants and restrooms, which can be useful especially when traveling with children. Once again we remember that this itinerary is only a personal suggestion and each of us must use the ideas of others to create our own itinerary. Next, we would propose that you take the Tram 28. This is an unforgettable experience for anyone coming to Lisbon and it's almost like picking up an electric stove for history. 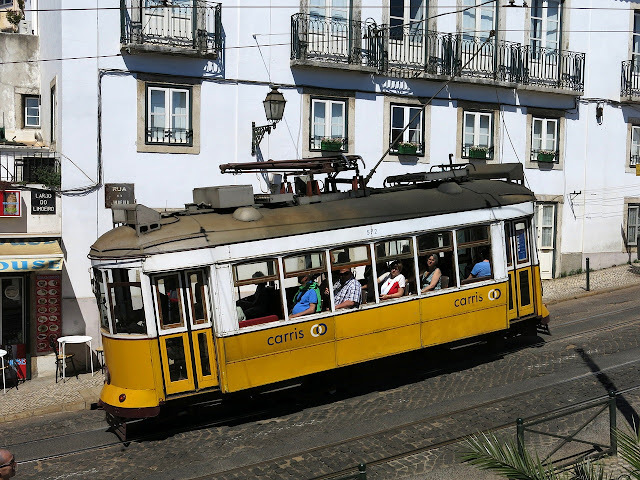 This is a circular trip that passes through a vast set of historic districts, which can start at Martim Moniz, passing by the Angels, Graça, Portas do Sol, Mirador de Santa Lúzia, Rua da Conceição, Chiado, Camões Square, Bica e Estrela. You can start where you want on the route, but if you are following this itinerary, what we would suggest is that you get the Elétrica 28 in Chiado (the exact place to catch the tram here, follow his route to Prazeres and then make the return trip, stopping by the Cathedral of Lisbon. After leaving to visit the Lisbon Cathedral, he would return to catch the Elétrico towards the Castle of Lisbon, to visit it and, after his visit to the Castle, he would return to catch the Elétrico until completing his journey in Martim Moniz. The ideal for this day is to carry your Viva Travel card with the daily ticket that will allow you to ride the tram, in the lifts and metro for 24 hours and it will be the most economic modality. To access more information, namely on prices and schedules, see his website here. On the way to the Castle, stopping at the Sé de Lisboa is mandatory. 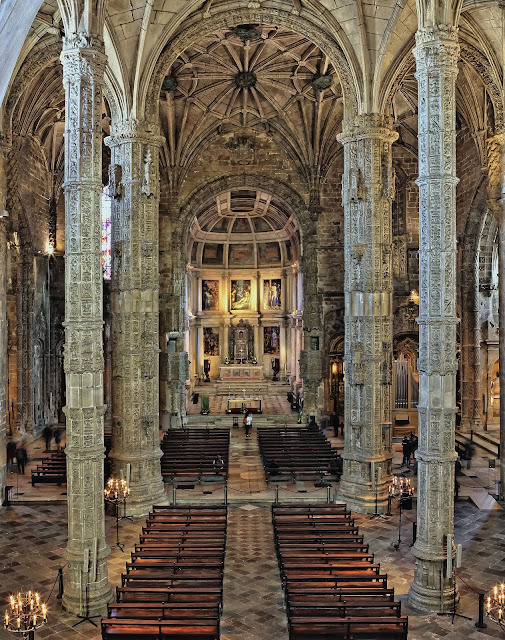 This is one of the largest and oldest churches in Lisbon, whose initial construction dates back to the 12th century and, throughout history, has undergone several extensions, thus encompassing several architectural styles. It is noteworthy that this church staunchly resisted the great earthquake that struck Lisbon in 1755. Admission is free. 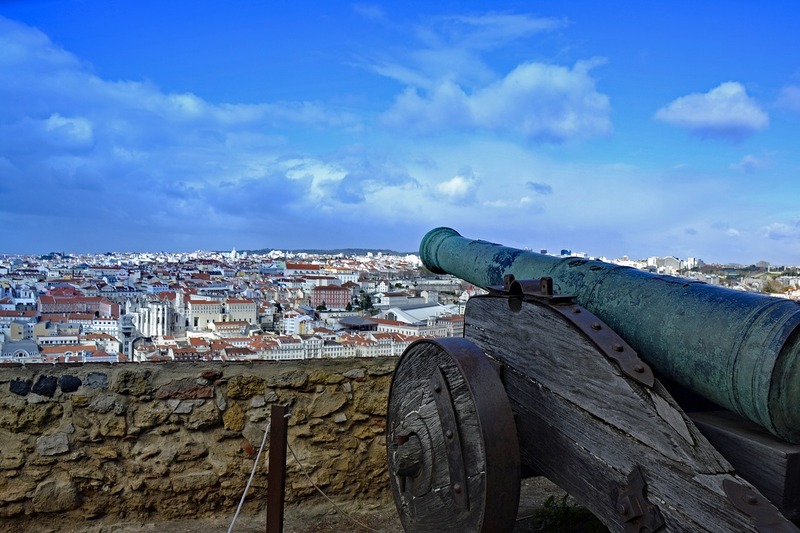 After visiting the Lisbon Cathedral, we suggest that you go to the Castle of São Jorge. This rise can be done by picking up the Electric 28 again or, in a course of 900 meters but, rising. 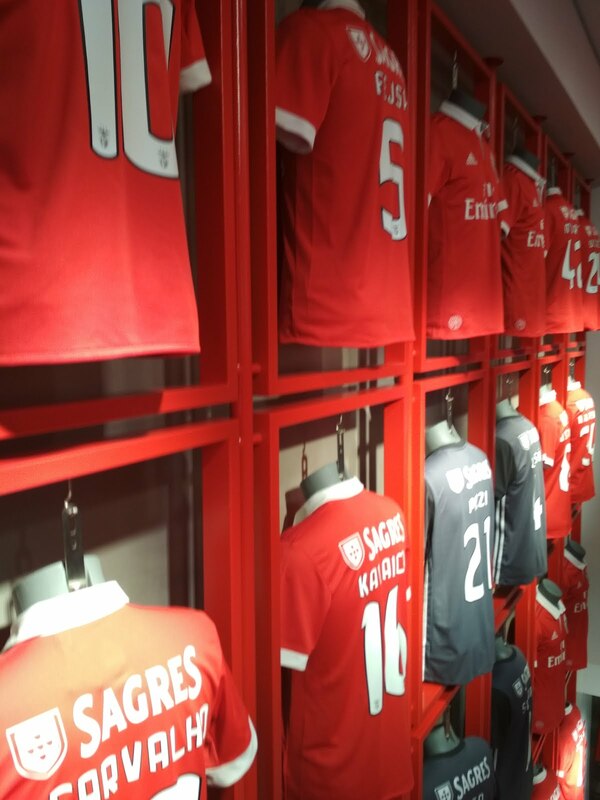 This is undoubtedly one of the points that can not miss a visit to Lisbon, which will delight children and adults. The Castle is located in the old medieval area, with narrow streets that allow you to imagine what the city would look like before the earthquake of 1755. The whole surrounding area is attractive and worthy of a wonderful walk, where you will be awash in the delicious scent from the food of the different restaurants in the area and listen to the sound of Fado, the traditional Portuguese music, now Intangible Heritage of Humanity. 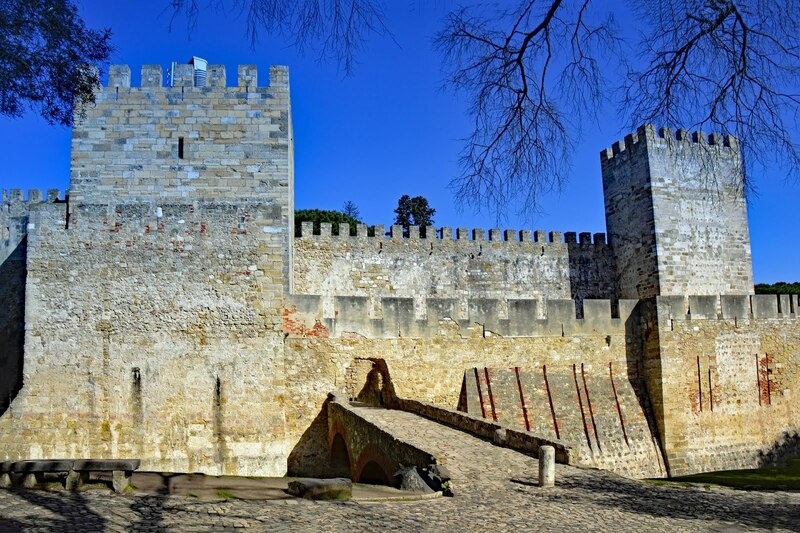 The Castle of São Jorge is at the top of the Hill and its date of foundation dates from the XI century, still before the emergence of Portugal as a nation. 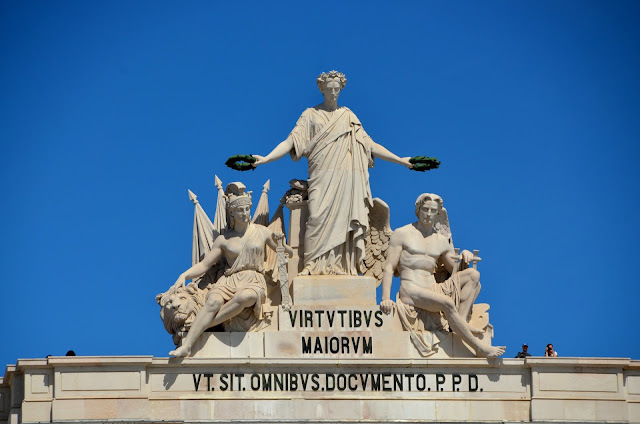 Of highly fortified specimen, its top seems to protect the city of Lisbon and, its visit is mandatory when in Lisbon, as it is obligatory a photograph of the view on the city and Lisbon and the Tagus River. To access more information, namely on prices and times, see his website here. If you have succeeded in completing this itinerary, the day will be long and tiring, but we could not fail to give you one more suggestion that, if it is not on this day, you can stay for any other of your stay in Lisbon. What we would suggest was to make the descent of the Castle towards the historic quarter of Alfama. This is one of the oldest and most characteristic districts of Lisbon. 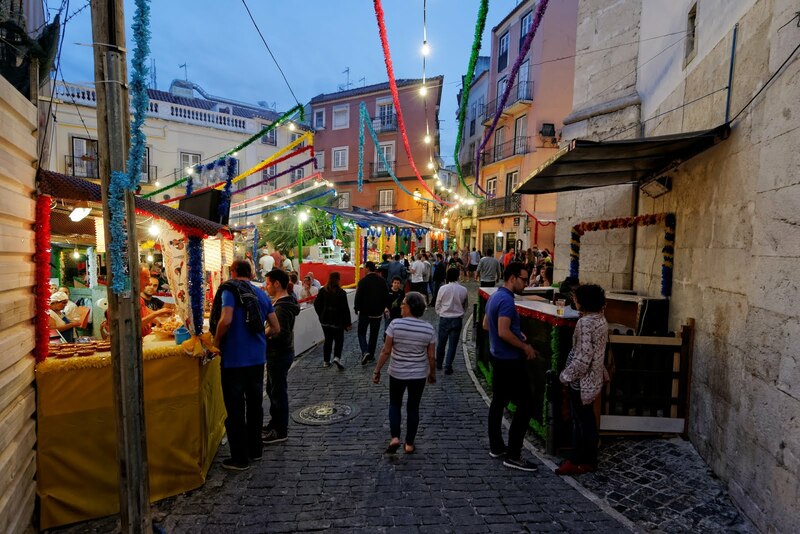 If in Baixa Pombalina the wide avenues are the main image, on reaching Alfama are the tight streets that mark, filled with restaurants with typical Portuguese food and typical Fado houses. Perfect place to dine and end a perfect day in Lisbon. The parish of Belém is one of the main tourist attractions in Lisbon. Much linked to the Portuguese discoveries, it was from this zone that many of the adventures began that spread the Portuguese people around the world, and make the Portuguese language one of the most talked about in the world, leaving its influence in the American continent, African and Asian. 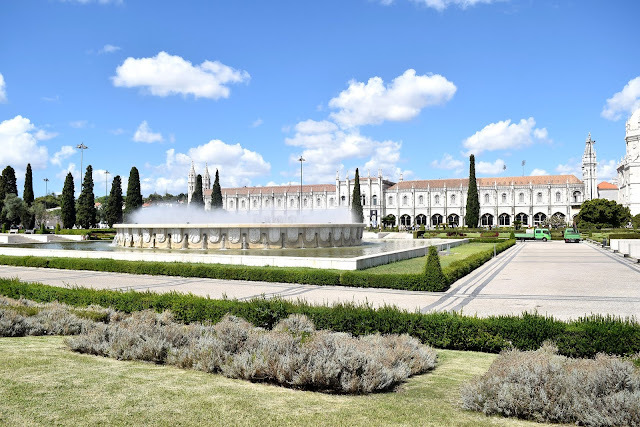 With a close connection to the Portuguese royalty, who took refuge in this area to escape the city center, is packed with some of the most important tourist attractions of the city, and important in the history of Portugal. For the visit to this area of Lisbon, we recommend a day of your stay in Lisbon, because there is a wide range of tourist attractions that you will find here. The parish of Belém is located in the Western part of the City of Lisbon, about 6 kilometers from the Baixa de Lisboa and you can access more information about how to get here from the center of Lisbon here. The offer in Belém is so vast that, under the assumptions we are going to make, they will probably have to choose the ones they most want to do because it may not be possible to see everything in one day. There will also be other options that the Non Stop Family may not talk about but will be of interest to you and choose those. Leave your comments in the comments below. In Non Stop Family we always avoid telling timetables and prices, so as not to risk deceiving readers with outdated data, so we always leave links to consult prices and schedules. In Belém, there are a number of attractions that are paid for. However, many of them are free to access on Sunday morning, so that may be a good chance to visit on that day. Of course, if you do this, you can always count on bigger queues to enter, but it's a price to pay for free access. Some of the attractions are closed on Monday, so if you go to Belém on that day, check the schedules in detail. In the reign of King D. Manuel I of Portugal, at the end of the 15th century, one of the most beautiful architectural works of the country was built, namely the Jeronimos Monastery. It is possible to visit only the Church for free but we recommend the full visit, as this is one of the most beautiful monasteries you can ever visit. On the left side of the Jerónimos Monastery, you will find the Navy Museum. This is a very interesting exhibition for adults and children, whose main point of interest is the Portuguese maritime discoveries phase. Also, next door is the Planetarium, which is always a good visit but as such is more universal and possible to visit in different countries, we will leave aside part of this itinerary. For more information on the Museum of the Navy and the Planetarium see here. In the Centro Cultural de Belém, just in front of the Planetarium, there is the Berardo Collection Museum. This is the largest museum of modern and contemporary art in Portugal, with a huge range of artists. It has a diverse cultural program, with many activities aimed at children and young people. Must visit for adults, we also recommend for children. To access more information, prices, temporary exhibitions, and specific activities for children, click here. If we do not consider the Berardo Collection Museum an unforgettable visit for those traveling as a family, the same cannot be said of the Museu Nacional dos Coches. Before arriving at its new facilities, do not walk through the Garden of the Square of the Empire, in front of the Jerónimos Monastery, a small but beautiful walk. 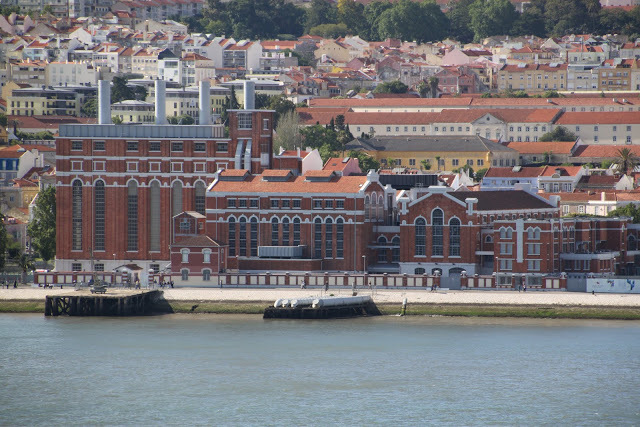 The Museu dos Coches, as it is known in Portugal, is one of the best known in Lisbon and, for good reasons. The collection is rich and varied, covering several items related to cars and cavalry throughout several centuries of the history of Portugal. This is one of the museums that you can not miss on your visit to Lisbon. Recently moved to more modern facilities, but also in Belém. To access more information, namely on prices and schedules, check their website here. 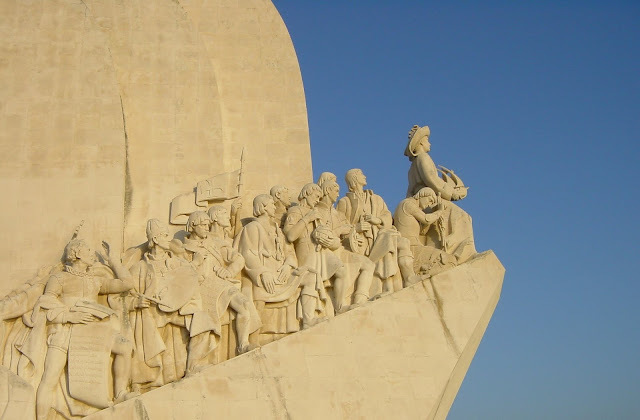 The Monument of the Discoveries was erected in its current version in 1960 and is a monument erected to honor the Portuguese discoveries of the golden period of its history. It is possible to visit and visit the exhibition linked to the discoveries but, the highlight of the visit is the view one has of its top. If you can, go inside but if you have to choose, we recommend you to see the beauty of its exterior and sega trip to the Tower of Belém. 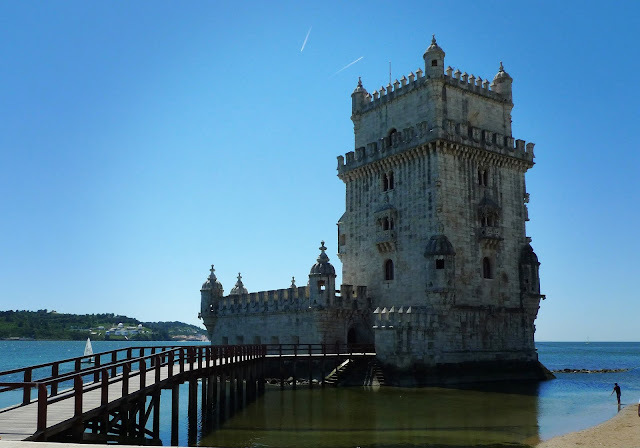 The Torre de Belém is one of the most emblematic monuments in Portugal and one of the greatest symbols of the period when it had an empire in the world. Built at the beginning of the 16th century, it is an icon of the architecture of the reign of King D. Manuel I of Portugal, which was built to serve as a defense post of the Tagus River, and is still decorated with several pieces of artillery. Seeing outside is good but we recommend you look inside. It is free on Sundays in the morning and it is possible to buy a joint ticket with the Jerónimos Monastery, another of the visits not to be missed. Of course, you can not go to Bethlehem and not eat one of the best cakes in the world, the Pastéis de Belém. The Pastéis de Belém is right next to the Jeronimos Monastery, and that is the reason for the recipe that led to the elaboration of this delicious delicacy. This is a must do experience. Our advice is to add cinnamon, but the best is to try one without cinnamon and another with cinnamon. In fact, we recommend that you buy at least one box of them because, believe me, one will know a little. About 500 meters walk from the Museum of Cars it is possible to visit the Museum of Electricity. This riverfront museum takes you into the history of electricity, from the days of coal and the way it was produced in the museum building, to the renewable energies, while still leaving children with interactive experiences with electricity. This museum often has temporary art exhibitions. For more information, including prices, times and temporary exhibitions, see his website here. If you arrive at Parque das Nações by public transport, you will most likely arrive at Oriente Station, a futuristic central transportation station set up for the 1998 World Expo and deserves a longer look as you pass through it. It was designed by the architect Santiago Calatrava and is a work that does not leave a person indifferent. 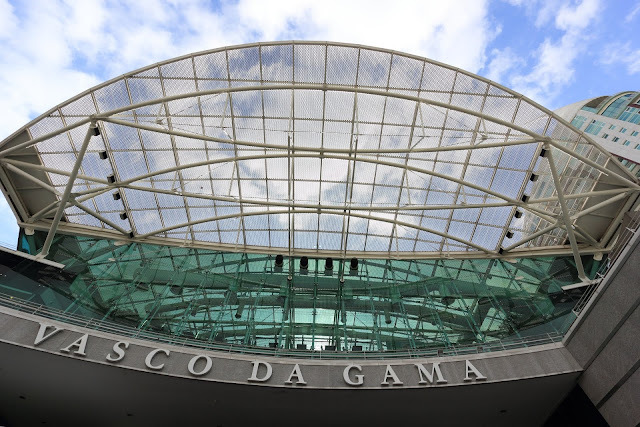 Our advice to get to the Gare do Oriente is to go by Metro and catch the Red Line. You will easily get there from the city center. If you wish to take advantage of a few hours to shop or enjoy the restaurant offer, even near the Gare do Oriente station is the Vasco da Gama Shopping Center. It also has cinemas. 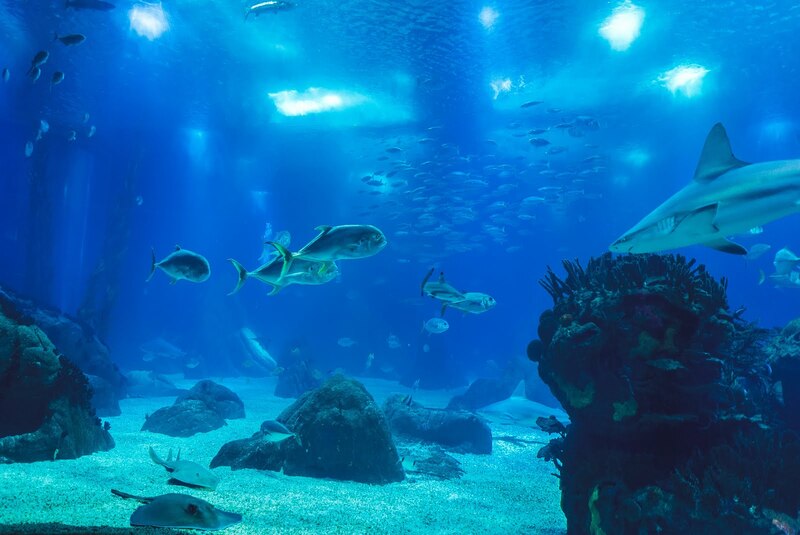 The main attraction of this new area of Lisbon is the Oceanarium. This is a Museum of Marine Biology and was built to be the main attraction of Expo 98. After 20 years, it remains one of the largest oceanariums in the world and has an extensive collection of species, whether mammals, fish, birds and other marine inhabitants. It is important to note that in 2017 was considered the best oceanarium in the world by TripAdvisor. A visit that can not fail. 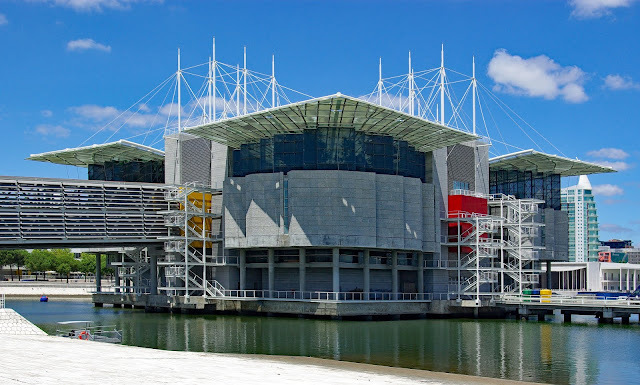 Right next to the Lisbon Oceanarium is the Pavilion of Knowledge, another must visit for anyone visiting Lisbon. We can say that the main purpose of this space is to prove that science can be fun and, after visiting it, will see that it fulfills its mission well. This is another space that has enriched Lisbon after Expo 98 and is a very interactive science and technology museum that aims to encourage the exploration and experimentation of the world of science by the children / young people. 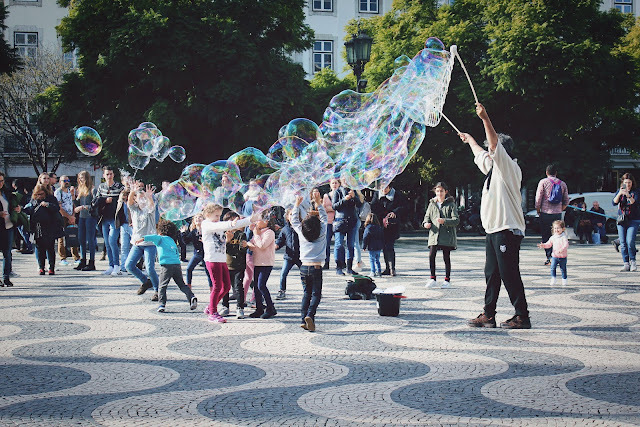 The number of activities and experiences you can perform is enormous and fun and is undoubtedly one of the best activities to do with your children in Lisbon. To access more information, namely on prices, timetables and temporary exhibitions, see his website here. 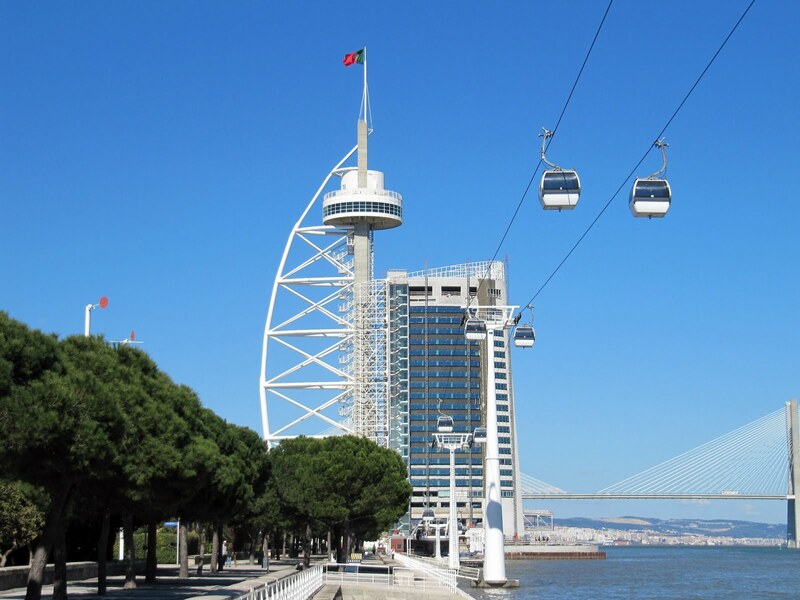 You can end your day at the Parque das Nações in Lisbon with a beautiful walk along the river, but if you want to rest a little, we recommend that you take the cable car right next to the Oceanário and that goes near the Bridge Vasco da Gama, an extension of about 100 meters. From here you will have a breathtaking view of the Tagus River and, especially on sunny days, you will be able to enjoy all its beauty. What we recommend is to buy the ticket only one way (or return) and take the other route on foot to enjoy this privileged area of contact with the river. To access more information, including prices and times, see his website here. And why not take advantage of the late afternoon to rent a bike and stroll along the river? This is a perfect place for such. The Park of Nations is full of impressive works of art and architectural buildings, let yourself be lost without fate and without haste. There are several rental stations. We leave here a link to observe and study prices and a youtube video. This three-day itinerary we've done is better for a family trip with children but, we think it has good ideas for all kind of people visiting our city. 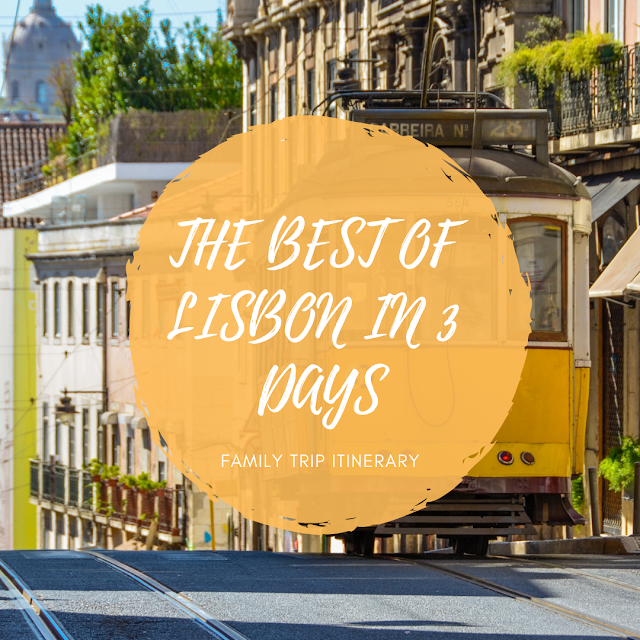 However, more suggestions could be put here, so we left the suggestion to consult our post of the best things to do with kids and family in Lisbon, so you can more activities and make your personal choices. The first day is the one that you have to walk more so, if you think that you can't do all in one day, you can save some activities for the other days, that have more activities and demand less walking. 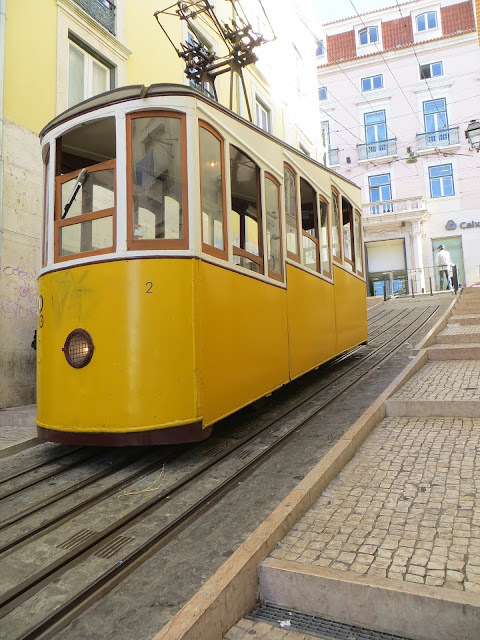 If you have booked a few more days for your trip to Lisbon, we suggest a day trip to Sintra (see here how to get there from Lisbon) and another day to visit Cascais (see here how to get there from Lisbon). The Viva Viagem card will allow you to easily access Lisbon's public transport. It's easy to use. Check here for detailed information on its use and prices. 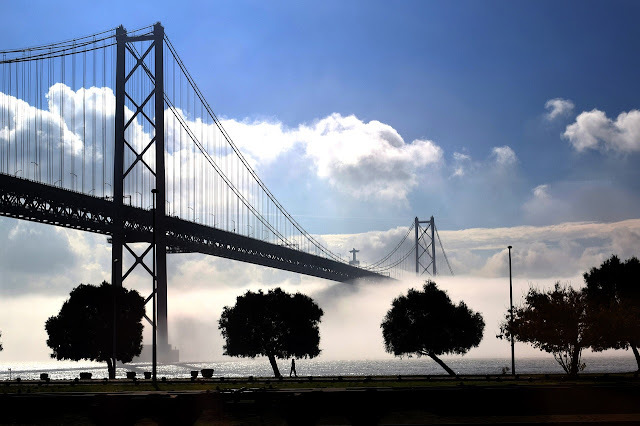 We hope that our article will help you plan your trip to Lisbon and if you still do not have a place to stay, we always do our reservations with booking, they are our partners and it's with them that we get the best deals. You can look for the best deals in your destiny by clicking here, it will not cost you any money and, it helps us to support our blog.